For only two hundred votes, Croatia did not elect a far-right deputy to the European Parliament. The Alliance for Croatia, a coalition of eight parties led by war-crimes convict Branimir Glavaš' HDSSB, did not manage to elect its own deputy in Strasbourg. On Sunday evening, celebrations in the headquarters started as soon as the the first election results appeared – it seemed that one of their representatives would get a seat in the EP. However, at the end of the ballot count, the deputy of the Alliance for Croatia was passed by the sixth candidate on the HDZ list for just 203 votes. Main opposition party HDZ therefore won 6 seats in the European Parliament together with its coalition partners, beating the coalition led by the Social Democrats (SDP) of prime minister Milanović, that only got four seats. The big surprise of these European elections was Orah, the party of former Minister of the Environment Mirela Holy. The small party, founded only six months ago, managed to attract the left-wing voters disappointed and dissatisfied by prime minister Zoran Milanović (SDP), therefore earning a seat in the European Parliament, where its representative will join the group of the European Greens. The HDZ obtained the 41.42%, followed by the SDP with 29.93% and OraH with 9.42%. These results were more or less consistent with the opinion polls conducted during the past few months. The question was just whether the Labour Party, until recently the third political force in the country, would get a seat. Because of its commitment to the rights of workers, the Labour Party used to be among the favourites of left-wing voters. However, things have changed with the appearance of OraH, currently seeming much more convincing in upholding social democratic principles. In addition, Mirela Holy also wore the halo of victim: Prime minister Milanović had removed her first from the post and then from the party. The dissatisfaction with the SDP and the possibility of an alternative led by a prominent former member of this party were the winning combination for OraH. The turnout was only slightly higher than last year when, just before joining the EU, Croatia elected its first deputies with only a 25.24% turnout. This time Croatia's turnout (25.25 %) overcame only those of Poland, Slovenia, Czech Republic, and Slovakia. Without the catastrophic floods that plagued South Eastern Europe shortly before the elections, however, voter turnout would have definitely been higher. The results of the European elections will have long-term consequences on domestic politics. The opposition, led by the HDZ, will seek to maximize the win. The demand for early elections (the regular ones are planned for the end of next year), so far sporadic and tenuous, could now become more insistent. The HDZ will try to take advantage of the victory in the upcoming presidential election as well, scheduled for the end of this year. At present, the HDZ has not officially announced its candidate yet, though the media bet on Kolinda Grabar Kitarović, former Foreign Minister, then Croatian ambassador in the U.S., and currently Assistant to the Secretary General of NATO. Although current president Ivo Josipović remains Croatia's most popular politician according to all the polls, most analysts believe Kolinda Grabar Kitarović could be his most dangerous rival. Josipović was an SDP candidate in the last elections, but the party's loss of popularity did not seem to affect him. The turbulent situation within the SDP will only get more complicated after the defeat in the European elections. The party's rating has been falling steadily. Although the HDZ was hit hard by the corruption trials of his former leader and prime minister Ivo Sanader – and was even sentenced for stealing money from the state coffers – the SDP has not taken advantage of the opportunity. Shortly before the European elections, polls showed that the HDZ enjoyed a solid advantage, and that if the elections were to be held now, it would get 23.3% of the vote, while the SDP would stop at 18.9%. Some minor corruption scandals involving low-level SDP officials, but also the inability of prime minister Milanović and his ministers to restart the economy, increase revenue, and decrease the number of unemployed, cost Social Democrats the citizens' support. End of line for Milanović? 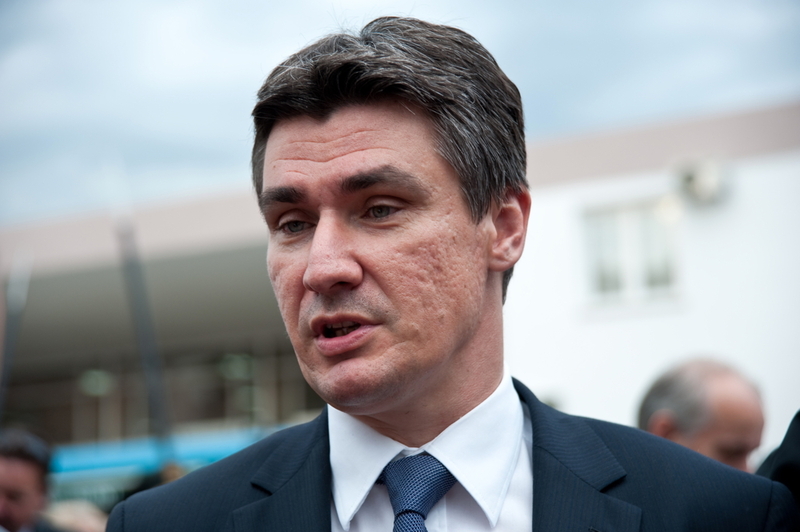 Prime minister Milanović, however, has another problem within the party. The recent removal of Finance Minister Slavko Linić visibly shifted the balance of power within the SDP, creating a united front of the powerful lobby of the Rijeka SDP against Milanović. With the electoral defeat also came doubts about the direct responsibility of Milanović, and things are further complicated by the fact that Tonino Picula (former Foreign Minister), marginalised by Milanović who had placed him fifth in the electoral list for the European Parliament, obtained the highest number of preferences. Time ago, many saw Picula as the possible successor to Milanović. After the triumph in the European elections (Picula got 48% of votes in the SDP list), this possibility becomes much more concrete.